In 2014, the HITS Journalist in Residence Program was announced for the third time – and for the first time internationally. Journalists from 22 countries applied. The jury chose the Barcelona-based freelance science journalist Michele Catanzaro. He joined the institute in August 2014 and will stay at HITS until mid-February 2015. 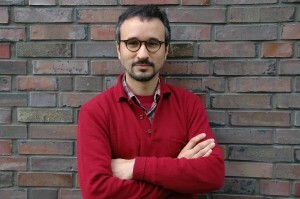 Catanzaro studied Physics in Rome and subsequently received his doctorate from the Technical University of Catalonia (Barcelona). Since 2000, he has been working as a freelance science journalist for media in Italy, Spain, Mexico and Great Britain, like magazines and newspapers such as Nature, The Guardian, Physics World, and El Periódico. His main topics of interest are in the area of science and science policy. He writes articles about these topics in four languages, but also produces short documentaries and writes scripts for television. For his work, he received the “King of Spain International Journalism Prize” in 2013, as well as the “BBVA InnovaData” Award for a project in data journalism. In 2016 he was elected “Euopean Science Writer of the year” by the The Association of British Science Science Writer (ABSW). Michele was using his stay to deepen his knowledge about the increasing amount of data in science. He is writing about his experiences at HITS in his Blog. Ever since he came to Heidelberg, Michele has striven to gain deeper insight into the German scientific landscape and to get in touch with German journalists. He was blogger at the Heidelberg Laureate Forum 2014, took part in the “Extremes 2014” Symposium organized by the Volkswagen Foundation in Hannover, attended the “Falling Walls” Conference in Berlin and gave a talk on “Crossborder Journalism” at the “Wissenswerte 2014” in Magdeburg. At his HITS talk with the topic “Put more Journalism into Science Journalism” he spoke on the importance of science journalism and explained how it has the power to save or to end lives. See the Video here on our Youtube-Channel. If you’d like to know more about Michele Catanzaro, please follow this link to his portrait.